Protects your leather surfaces for up to 3 months! Repels dirt, grime, sweat, dye transfer, etc. The Gyeon Leather Coat allows you to protect your leather safely and easily! As a car lover, many of us enjoy the smell, look and feel of brand new leather. Even if you treat your leather great simply getting in and out of the car can have a negative effect on the leather long term. Dirt and grime will be brought into the car, the leather will be exposed to harmful UV rays, dye from jeans can transfer to the seats, etc. The key to keeping your leather looking, feeling, and smelling brand new is to take the proper precautions and keep them cleaned, nourished and protected. With Gyeon Leather Coat, all of the proper precautions have been packed into one easy to use formula. With a clean microfiber towel, apply a few sprays to the surface and wipe into the leather. Leather Coat will cleverly apply an invisible layer on the surface of the leather surface, offering protection against dirt, sweat, UV rays, dye transfer and much more. Leather Coat is hydrophobic and lasts up to 3 months on most leather surfaces, but most importantly, it will not affect the way the leather looks or feels. This allows your leather to look and feel brand new, just like the day you brought your car home. Don't let the elements hurt the finish on your leather, let Gyeon Leather Coat protect them for months! If you are looking for a more durable form of protection, the Gyeon Leather Shield is a great option! Vacuum and clean leather with Q2M Leather Cleaner. Do not use Leather Cleaner with oily components. Let the surface get dry. 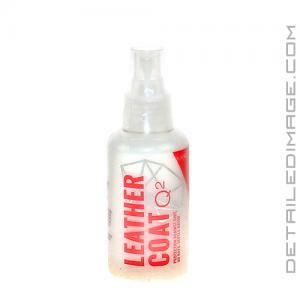 Apply Q2 Leathercoat with a soft cotton or MF applicator pad. Secure even coverage of the surface by using moderate amounts of product. Let it dry for few hours, use hairdryer to improve curing. Love this leather conditioner. I use the Gyeon cleaner ahead of this product and could not be happier. The look is very matte which I like as it looks natural, no shiny greasy finish. Great stuff.